Open Data Day: Calling all coders. Hack with us for your rights. If you are a coder and interested in civic issues, we need your help! 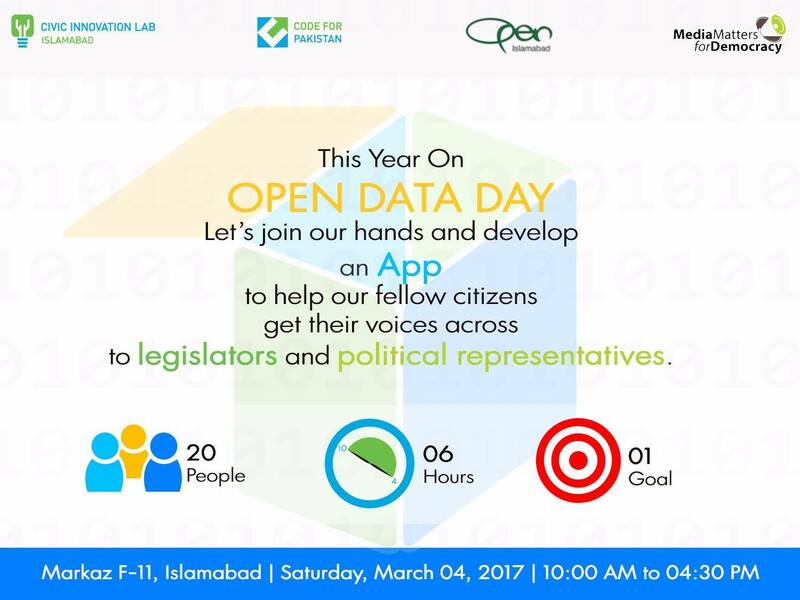 What: Commemorating the Open Data Day, Media Matters for Democracy and Code for Pakistan are hosting a Hack-Day to develop a tech-based solution to get your voice through to the policymakers. Elections are just around the corner, political campaigning is just about to start and now is the time to, once again, start pushing for legislative reforms in various sectors and get commitments from your political representatives. PEMRA needs to be independent. Prevention of Electroinc Crimes Act 2016 needs to be more citizen-friendly and respectful of civil liberties. Right to Information law needs to be refined and the list goes on. However getting your voice through to the legislators and the policy makers is always a challenge. We have, once again, joined hands with our long-term partner ‘Code for Pakistan’ to develop an easy solution to tackle this challenge. Together we are hosting a ‘Hack Day’ on the 4th of March which is commemorated as ‘Open Data Day’, to develop a mobile phone application that will help citizens send direct messages to their political representatives of their particular constituencies. 20 people, 6 hours and 1 goal! If you are a developer and/or a designer, and want to be a part of this thrilling exercise, you are welcome to join.